An early, forgotten master piece … no pictures, no text, no audio, no video … (that’s how myths are created). A short performance by Chris Kondek, Christiane Kühl, Herbert Klitzsch and Victor Morales in the frame of „One table, two chairs“ at the Festival of Visions at Haus der Kulturen der Welt (Berlin) in 2000. You might doubt the superlatives above, but you cannot doubt this: The performance took place on the most beautiful stage ever. 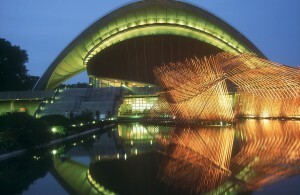 A bamboo pavillon on the pond infront of the House of World Cultures by Hong Kong architect Rocco Yim.